The Road to 24 is about my racing in the Global Mazda MX-5 Cup Series. It’s a spec series, and while I take knowing what that is for granted, there are a lot of new fans who aren’t familiar with the term. A spec series means that the cars are virtually identical: the same body, the same components, the same tires, and so on. Several mechanical aspects of the car are sealed, meaning you can’t make any changes to them, including the ECU from Mazda Motorsports, the transmission, and the motor. The number of modifications that you can make to a spec car is limited. In the case of the MX-5 Cup Series, we are only allowed to change the setup and the driver’s seat. But of course we can give our cars plenty of personality: from paint schemes to sponsor logos to, in my case, a hot pink roll cage! Long Road Racing builds all of the Global MX-5 Cup cars, so every one on the track has been built by the same company to make sure everything is identical. This spec format has a number of advantages. For one thing, having an even playing field means better competition! The series has some of the closest wheel-to-wheel racing around because the cars are so equally matched. Another advantage of racing a spec series is that it’s financially friendly. It’s a great avenue for upcoming racers because the restrictions keep costs down, and how much funding you have doesn’t determine how fast your car is! Because MX-5 Cup is a spec series, I have a list of what I can use when it comes to tires, fuel and other necessities. It makes life easier because you don’t have to search through a lot of brands and products, and you know that each supporting manufacturer will be at the track on an event weekend in case you need a replacement part. And yes, sometimes competitors try to cheat the system! You can actually file a protest if you suspect someone isn’t playing by the rules to keep it a fair game. Spec Miata is a spec series, too, but on a club racing level. When I transitioned from Spec Miata to MX-5 Cup, I discovered that the car is a lot easier to drive. That actually made it a challenging transition, because I was used to driving a car that took a lot of physical input to get around the track quickly (suddenly having power steering was a huge bonus). 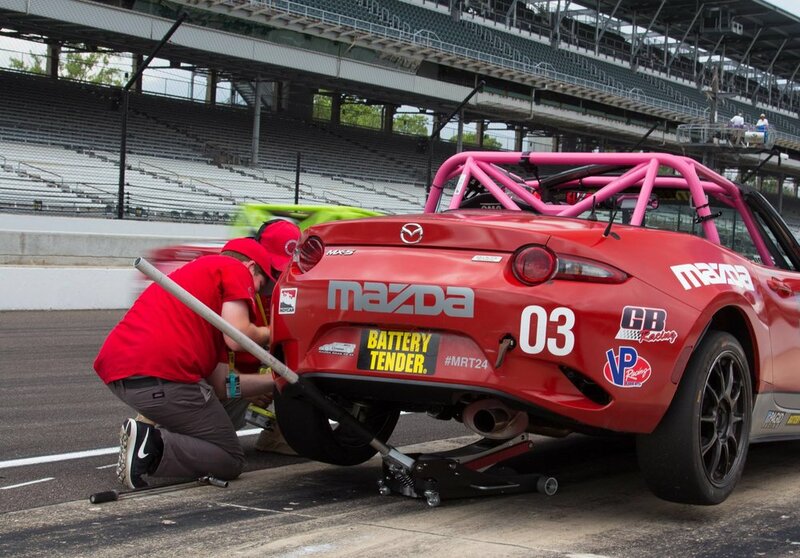 The suspension on the MX-5 Cup car is softer, the tires have more grip, the transmission is easy to heel-toe with, and the motor has more power than a Spec Miata. It’s literally different from front to back, but it still has the historic marks of the first-generation Miata. Like a spec series, some things always stay the same!